A few months ago, I read a wonderful book called The Lost Ravioli Recipes of Hoboken. It's the story of a woman--a historian--who sets about tracking down the long-lost ravioli recipes her relatives once made in Italy. The story weaves food history with memoir and recipes as she bounces back and forth between Italy and New Jersey, past and present. What stayed with me most is a wonderful scene where the author spends a long day pouring through ancient cookbooks in the library stacks. She's desperately trying to figure out why it is that the women in her family always stuffed the ravioli with raw meat instead of cooked, the way it is traditionally done in Italian homes. She searches and searches for a reason and in doing so realizes that every culture and tradition has its own version of ravioli and that each kind fed off of each other. She learns, for example, that the varenyky and pelmeni of Eastern Europe originated in China and were brought West by the Mongols into Siberia from which they gradually spread throughout Russia and Eastern Europe. The kreplach served in Jewish homes during the High Holidays is said to have originated in the ravioli introduced to Germany by Ashkenazi Jews who arrived there after having been expelled from Venice in the 14th century. 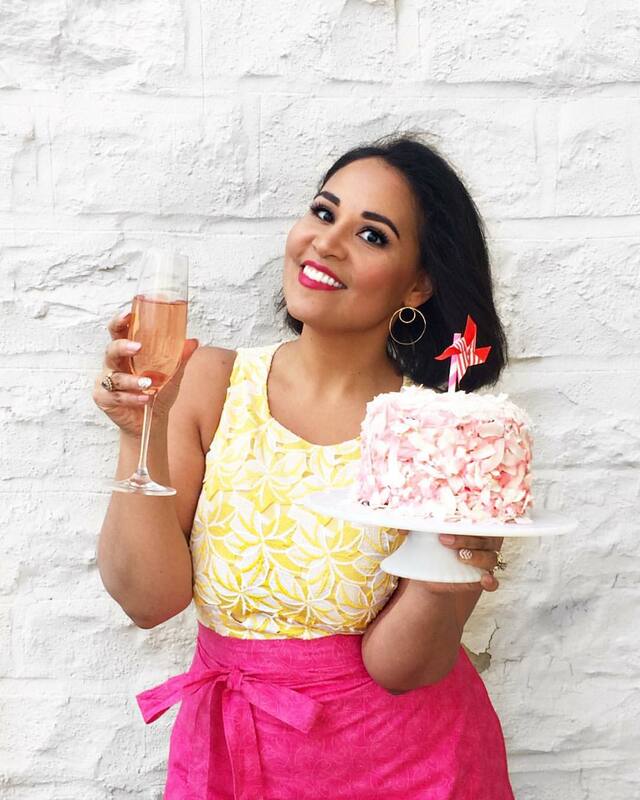 She realized the similarities between her traditional family dish and the manti that is popular in Turkey, the shishbarak eaten in Lebanon, empanadas in Latin America, and even (unexpectedly) sandwiches (meat and/or cheese layered within slices of dough!). 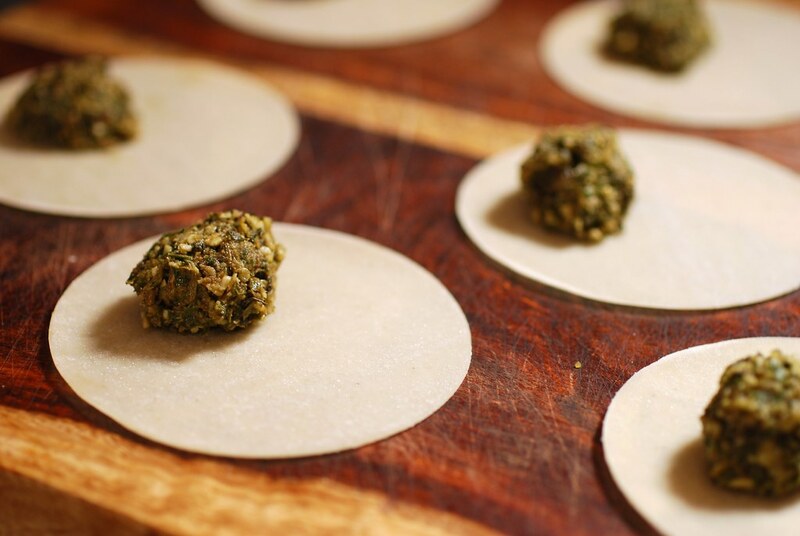 I thought about those connections again recently when I stood in my kitchen rolling little balls of chilled pesto genovese and tucking them into premade Gyoza wrappers. 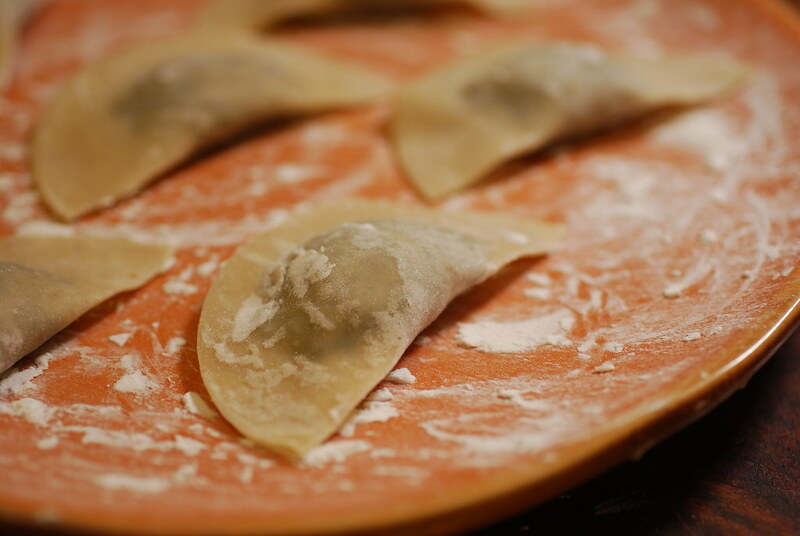 This method is an easy and increasingly popular way to make homemade ravioli without the laborious (albeit incredibly satisfying) work of rolling out pasta dough from scratch. It is also a pretty tangible example of the way that cultures meld seamlessly in the kitchen (sealed with a wet fingertip dipped in starch). The recipe itself is a simple one that belies the history-laden centuries that precede it. Simply a basic pesto of basil crushed with olive oil, garlic, hard cheese, salt, and almonds (I was out of pine nuts) tossed into the food processor or blender or (as I suggested to an incredulous coworker this afternoon) even roughly chopped by hand with the rapid rock of a mezzaluna. Rolled into little balls in the palm of my hand and then placed carefully on one half of the packaged rounds (or squares; won ton wrappers work too). A little finger bowl of water is all the glue necessary to bind the halves together forming neat half-moon shapes. I should note that this technique actually produces a pasta shape called Agnolotti, which means "priest caps" because of the way the folded over half-moon shape mirrors the little curved hats priests once wore. It's now come to refer to any kind of stuffed pasta that is folded over from one piece of pasta, instead of two pieces layered on top of each other. After a quick boil in salted water, the Agnolotti come out whispery light and translucent. A drizzle of olive oil or a quick shave of Pecorino and the dish is complete (the sauce, after all, is inside). This pesto recipe can be easily modified and multiplied as necessary. Try adding roasted red peppers or anchovies. Swap in any variety of nut. And don't even feel restrained by the basil. I'm actually toying with a version made with a Thai-style version made with cilantro, ginger, and peanuts. But that will have to wait for another afternoon. Combine all the ingredients except for the olive oil in your food processor with the chopping blade attached. Pulse while gently drizzling in the olive oil. You want to finely chop all the ingredients without pureeing them. Once it is ready, taste and add salt if necessary. Pour into an air-tight jar or container and store in the refrigerator or freezer. Note: The lemon juice is optional, but it will help keep the pesto green if it is not all going to be used immediately. 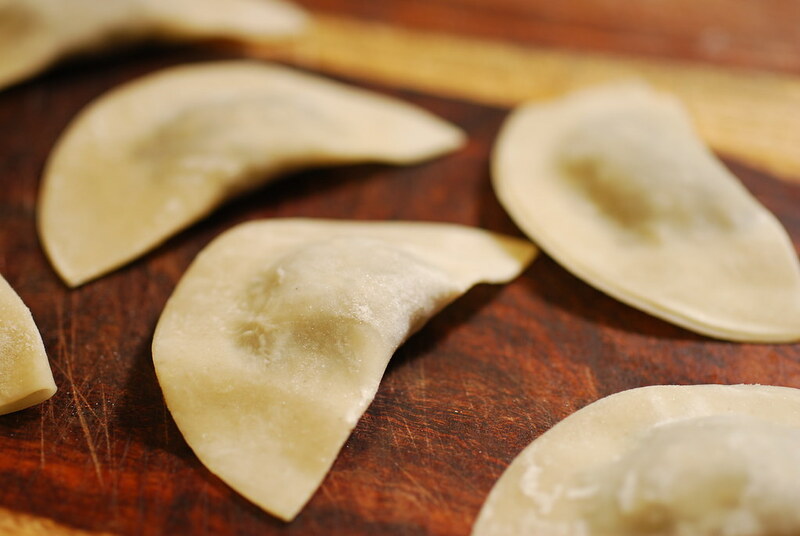 Spread the Gyoza wrappers on a dry and flat surface (make sure it is dry as any moisture will combine with the starch on the wrappers causing them to stick). Use a teaspoon to measure out a generous rounded portion of pesto into your hand. Roll gently into a ball and place on one half of the wrapper. Work in batches and fill 5 at a time, then use your fingertip dipped in the warm water to brush the outside of each wrapper. Bring the empty side over the filling and pinch shut, making sure to push out from the filling towards the edge in order to remove all the air. This will keep the dumplings shut while boiling. Repeat with remaining wrappers and pesto. To cook, bring a large pot of salted water to a rapid boil. Add the agnolotti in batches (cook no more than 15 at a time or they'll stick to each other) and let cook for 4-6 minutes or until they rise to the top and look translucent. Remove with a slotted spoon and serve immediately topped with olive oil and grated cheese. 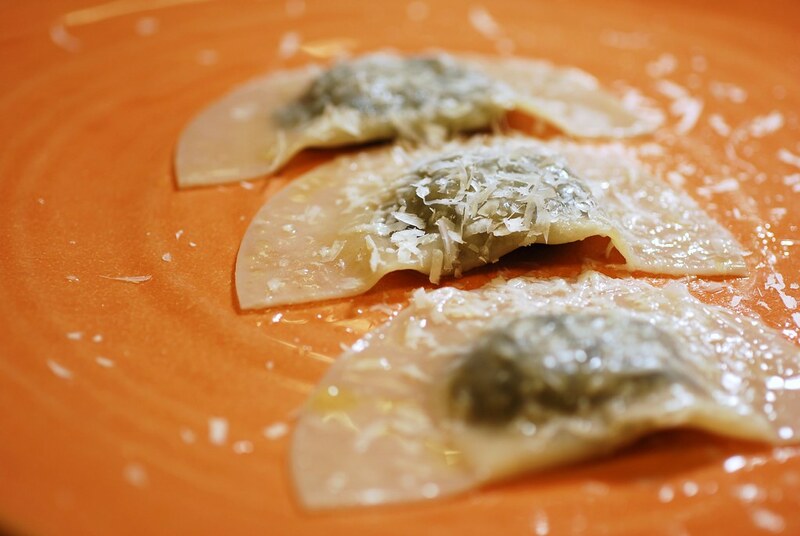 Cook's Note: the agnolotti can be prepared and sealed then frozen to be cooked at a later date. No need to thaw before cooking, just leave them in a minute or two longer. Beautiful post. I look forward to trying this recipe. As I'm pushing the Gyoza wrappers shut I'll think of your story, as well as the story of everyone who made preceded us. Thank you. these look like the perfect summer dish. Very nice! I've never thought of using almonds in pesto, but that sounds like a great alternative to pine nuts & somenthing I'll want to try myself! That looks lovely! I just browsed through some of your recipes..and they are all wonderful! I am your latest fan and follower! Yum! These look delicious! Nice presentation too. great blog. I love the name. These look delicious.